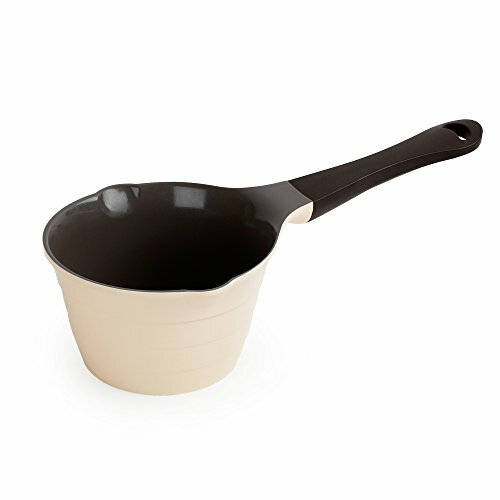 Neoflam is known for their exceptional cookware, and this single serving saucepan is a shining example. The small size, 1 quart capacity, maximizes utility. You will find yourself reaching for this tiny warmer time and again. The milk pan is perfect for: heating leftovers if you have ditched the microwave, latte, chai tea, Greek coffee, Turkish coffee, pour over tea and coffee, oatmeal, chocolate, ganache, cheese sauce, gravy, soup, frozen vegetables, scrambled eggs, ramen, cream, syrup, candy, frothing, clarifying butter, baby food, baby bottles, hot cocoa, ghee, beans, and so much more! It is petit enough to be convenient, and sturdy enough for every day use. The cute design is both rustic and modern. It's the miniature saucier you've been dreaming of for years. Unlike stainless steel or cast iron alternatives, the cast aluminum body does not scorch and heats quickly. In fact, keeping it on low to medium heat is recommended. No preheating required. The thick base will distribute heat evenly. There are two pouring spouts for left handed and right handed chefs. You can easily scrape out the interior with a silicone spatula thanks to the gently sloping walls. The spout generates a nice, even pour when buttering popcorn or drizzling chocolate. Finally, you don't need to create a double boiler every time you want to satisfy your sweet tooth. The Classic Milk Pan You'll Cherish For Years! Neoflam has been at the forefront of cookware design and manufacturing since 2008. Their patented coating technology and innovative cast aluminum production combine to create a new standard in cookware. With a commitment to health and quality, Neoflam delivers cookware people will be proud to use in their kitchens, and pass down for generations.